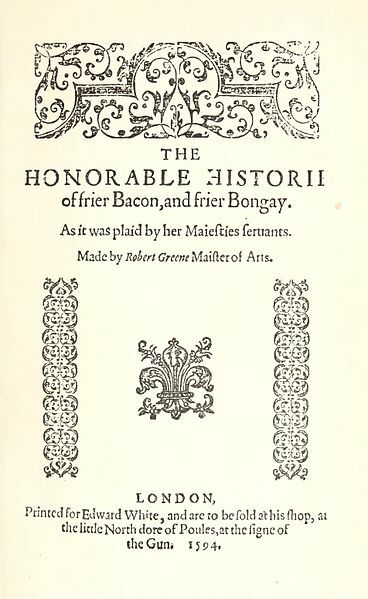 Introduction: Though Robert Greene’s play Friar Bacon and Friar Bungay has traditionally been discussed in terms of itsstatus as the ﬁrst romantic comedy, literary critics have recently begun to turn their attention to the way that the play’s action and plot serve as social commentary. Taking their cue from William Empson’s seminal observation that, in Friar Bacon, ‘the power of beauty is like the power of magic; both are individualist, dangerous, and outside the social order,’ these critics have focused on the general, metaphorical links between love and magic. It is important to recognize, however, that the friar’s magic in this play is more than a general metaphor for human ambition or emotion; Greene’s depiction of the brass head that Bacon creates and attempts to animate by way of his occult knowledge during the course of the play is a speciﬁc lampoon of the scientists and science of his day. My discussion in this essay will center on how Bacon’s automaton descends from a tradition of oracular heads, which serve as symbols of mysterious knowledge, and how, in Greene’s play, the talking metal head that Friar Bacon creates is an emblem of popular suspicion toward the practitioners of innovative science. I shall also touch brieﬂy on how Greene ﬁrst makes use of this emblematic tradition of the artiﬁcially-made, talking head in an early play, Alphonsus, King of Aragon.